Costa Ronin. Photo: Bobby Quillard. When Russian-born actor Costa Ronin is not running around the set of FX’s The Americans as Oleg Igorevich Burov — a KGB officer working at the Rezidentura who is irrefutably in love with the enchanting Nina (played by Annet Mahendru) — alongside his equally talented castmates Keri Russell, Matthew Rhys and Noah Emmerich, he can be found exploring the world around him. From venturing inside the pages of books where he seeks inspiration for the characters he adapts as his own persona, to the vastness of the open sea, which leaves a combined aura of mystery and invigoration burning long inside him, Ronin sets off on adventure after adventure. And it is exactly this adventurous spirit fueled by a passion for acting that has led him from the international stage to the television screens of Americans nationwide. Calling his chance to tell stories “a gift,” the recent Los Angelino with piercing brown eyes paints a masterpiece with his body language and dialogue as he takes us into a magical world where ideas, thoughts and words come to life before one’s eyes. Here, Ronin discusses his love for sailing, his newfound fascination with comic books, and, of course, the cinematic experience and heart-stopping action of The Americans. Editorial Note: This interview took place in April and was halted in publication due to the Tribeca Film Festival. GALO: The Americans is constantly ranked among critics’ lists as one of the best shows on television, but it has yet to bring in major awards. Do you guys go to work with a chip on your shoulders? Costa Ronin: Our show is about storytelling. It’s not about the accolades or being acknowledged, it is about telling the stories that need to be told — so, no, absolutely not. GALO: Well, hopefully, the show will win some more awards in the future. CR: Well, it would be nice. I’m not going to lie, it would be nice. But everyone feels the same way about it; it’s an acknowledgment of our work. At the end of the day, it is all about the story and the show. The greatest compliment we can receive is the audience — people who love the show and respond to the stories, much like you [have], [and] who watch and remember moments in the show. That’s why we do it. GALO: Now from what I read, you grew up in Kaliningrad, Russia. I’m curious, how do you feel the show reflects your native home and the KGB aspect of the story? CR: I was young when the events of the show were taking place, so I haven’t really had a chance to experience it firsthand. However, like [most] everyone in the Soviet Union and the world, I do remember when the Berlin Wall fell and the Soviet Union disintegrated — and those were really milestones in history, regardless of [whether] you were in the Soviet Union, United States or Australia. It affected us [all]. So I do remember that it was definitely a very turbulent time. The country went from stability and where you knew what was going to happen — as well as having security with free education and a free medical system — to all of a sudden, it becoming very foreign and unknown. It was almost like the old wall had fallen, but the new one wasn’t in place yet. The ’90s, especially, were very turbulent in Russia. GALO: How old were you when the events that are taking place in the show were happening? CR: I was born in 1979, so by 1982, I was three years old. GALO: So I gather you don’t have much of a recollection of that period given how young you were — but perhaps you have some semblance of it from family stories? CR: As you get older, the memories that you have, you don’t know if they are memories you had. [These] memories, they’re like books you read or stories you heard of experiencing life at that time. So, at this point, I don’t know what I saw exactly or what was created by my imagination over [the span of] 30 years. 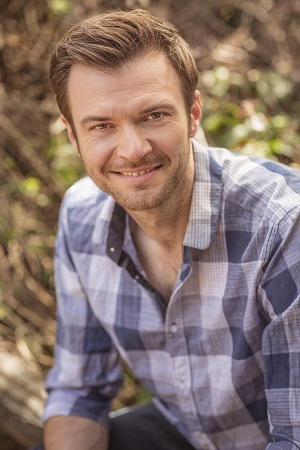 GALO: Your character, Oleg Burov, entered the third season after Nina Sergeevna (Annet Mahendru) was taken back to Russia in the second season’s finale. Can you talk a little bit about what you did to prepare for your role? After all, your character lost someone who he deeply cared for in a move that he viewed as something that would last forever. CR: Well, there’s always hope. You can’t live without hope or do anything without it. Love and fear is what makes us do anything. So I don’t particularly create a moment, I create the character — and then I let the character live in that moment. I did a lot of work going into the show to make sure the character [came out] well-rounded and wholesome. I [always] want to make sure that when I’m on set, I am synchronized with everything on set and [can] turn that switch [on] that is not mine but the character’s. So that moment with Nina, [at the end of the second season], was very real because those two have had an amazing feeling of coming together and falling in love. It was very emotional. I mean, how would anybody feel losing someone so dear to them? The complexity of their world is that they cannot express themselves. You and I live everyday life and can have someone to love and can tell them how we feel about them. Those two, they could not. GALO: Did you have any personal moments that you could draw from for that moment with the character? I believe we all have had our share of disappointments or heartbreaks at some point in our life — or at least one. CR: Yes, absolutely. Everything in the show is just a premise. At the end of the day, the show (and what it is today) is because of its premise, and not because of the Cold War. It is because their world is being created and the characters and the relationships that they have. So losing someone who you love so much and being betrayed by them at the same time is hard, as is [the inability to know] if the insecurity [you feel is] from the greater unknown. At that point in time, you know that there is nothing you can do because you have done everything. That moment last season where Oleg brought Nina an envelope of cash that was a very difficult scene for him — because he is basically [thinking] that this is all he can do, and that this is the best he can do. By letting her go, he is choosing to save her over them being together — or even over his loyalty to the KGB and the cause. There was definitely a lot going on [with Oleg] last season. GALO: Your character is interesting because his father has a lot of connections back in Russia. In fact, some would think that he could probably pull a few strings back home because of this. Needless to say, Oleg’s actions made him look defenseless at the end of the second season because he couldn’t pull strings like he thought he could to save her. CR: Last season, he didn’t really pull any strings because nobody knew what was going to happen with Nina. Nobody knew that Stan Beeman [Noah Emmerich] wasn’t going to come through. Nobody knew that she was going to get arrested. That’s the beauty about doing a television show — everything happens in real time. When you work on a theater project or a film, you know the whole script, where the story starts [and] how it ends. In a TV show, you have no idea. It is like real life. You don’t know what is going to happen in an hour, tomorrow, or next week. So at that point, when Oleg was trying to do all of those things for Nina, she had no idea how it was going to turn out. She had no idea whether she was going to take the envelope and run. He didn’t know that Nina was meeting with Stan behind his back and reporting. He knew that she was meeting with Stan as part of the operation, but they didn’t know that Nina was meeting with Stan and not reporting. So that is something that Oleg found out during this season. Backstage, when Oleg was going through these experiences, he had no idea what was going to happen. Nina had no idea what was going to happen. GALO: Without spoiling too much, what is Oleg headed for as the end of the third season approaches? GALO: Can you briefly describe how you go about preparing Oleg for his new relationship with Stan as the two characters try to find a way to save Nina from the fate that she sealed for herself in the last season. Is this hard for Oleg to do? CR: Yes, absolutely it is hard [for Oleg]. This is where the duality comes into play. All those characters are written so beautifully — they are not single-minded, instead they are so multifaceted. Yes, we know that both Stan and Oleg love Nina. Regardless of how they feel for each other, Nina means a lot to both of them. On the other hand, both of them work for intelligence organizations which are at war with each other — or [rather] their countries are at war with each other, more or less. The Cold War was still a war. By definition, they are enemies. And yet somehow, they have to [work together]. But there is another cause that will force them to come together. They have to figure out a way of working together for this cause, which both of them find greater than the Cold War. For both of them, it is an exploration. For both of them, it is very tricky to find a way to work with each other because they live in worlds where nothing is what it seems. You can’t tell anything truthful to anybody you work with, sleep with or love, let alone someone who is your known enemy. So they have to figure out now how to trust each other without trusting each other. That is what we are exploring this season between those two. GALO: Do you feel like Oleg fully trusts Stan at this point? CR: Absolutely not. I don’t think he can. It is one of those things where he can’t. No one can. That’s the world they live in. The moment you begin trusting somebody is the moment you lose your life — especially if you are working with them. And if it is someone who is your known enemy, the chance of him going after you and sabotaging this whole thing is tremendous. It is very much treading on eggshells, as well as finding this energy and just enough truth to what’s being said to you to make an educated decision about what to do and how to move forward. GALO: You did have a nice swing at Noah Emmerich (Stan) in the last episode though. It was a nice punch. CR: Oh, yes. Thank you.